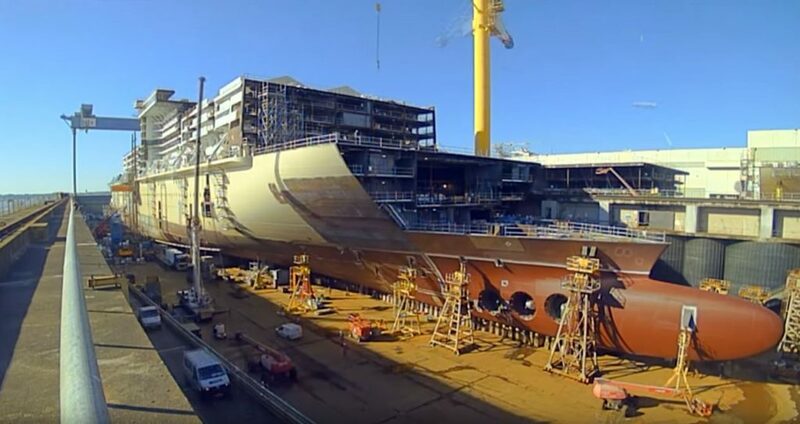 MSC Cruises floated out its largest ever cruise ship yesterday in France but I think there was more excitement for the ships stunning time-lapse construction footage. The cruise line didn’t release one but two time-lapse videos. The new videos were released on August 2 which was when the huge MSC Meraviglia floated out of its dry dock for the very first. The 167,600 gross ton vessel will now begin the final stages of construction. If you missed the ship coming together block by block then the Bow and Stern time-lapse videos will show you how it all happened. MSC Meraviglia is being built at the STX France shipyard in Saint-Nazaire which is the same place where Harmony of the Seas was built. The shipyard used 35,000 tons of steel, more than 300,000 steel parts, 1,500 kms of cable, 100 kms of ventilation trunks, more than km of pipes, 80,000 lighting points and 300,000 liters of paint. All kinds of materials will be used as the fitting out phase begins. MSC Meraviglia will enter service in June 2017 and will introduce a ton of new features and experiences for guests to enjoy. The cruise line revealed plenty about the ship earlier in the year. The ship will carry 4,500 passengers at double occupancy and will spend its inaugural season sailing the Western Mediterranean. A second sister ship named MSC Bellissima will also enter service in Spring 2019.